Amphenol/Pyle: Star-Line Series - Eastern Connector Specialty Corp.
Star-Line Neptune Series “ZP/ZR” connectors are heavy duty environmentally sealed plugs and receptacles and have been successfully used in all types of Industrial and Aerospace applications. These compact environmental connectors have provided outstanding performance in complex ground support cable networks, automatic and process control Systems, and instrumentation systems. This family of connectors has made a major contribution to the successful interconnection of peak power generating Systems as well as off-shore petroleum production for power distribution and data acquisition. The specific materials and design features incorporated in Star-Line connectors were originally selected to satisfy the stringent requirements of the Aerospace Industry for heavy duty connectors. 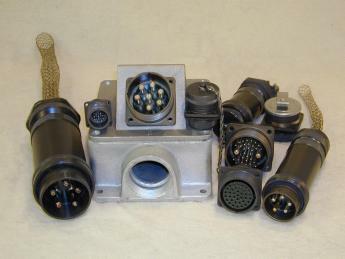 These connectors combine electrical and mechanical capabilities that equal or exceed the perform-ance parameters established by the Military Specification M IL-C-501 5. The environmental highlights chart shown on page 5 is based on this specification. CIRCUIT BREAKING-UIL & CSA Listed power types have been thoroughly tested for capability to rupture current at ratings Iisted. SOLDER, CRIMP AND PRESSURE TERMINALS-Available in circuit breaking power and control types as listed. EASILY ACCESSIBLE WIRE TERMINALS-Conductors are readily terminated to contacts. Cable housings are slipped over conductors or leads after terminating. Cumbersome handling and seating of inserts with conductors attached is eliminated. LARGE WIRING SPACE-Ample wiring space is provided in cable housings and conduit fitting bodies. Hub of body mounts in any of four positions (except FS & FD box assemblies). REVERSIBLE INSERTS-A full range of contact inserts and application adapters are available. All are interchangeable and reversible to suit special needs. DOUBLE LEAD THREAD COUPLING-Modified Acme thread does not clog under adverse condi­tions of ice, snow, sand or mud and provides quick coupling feature. HARD ANODIC COATING-All machined aluminum parts finished to 40 Points on Rockwell C Scale. HIGH TENSILE STRENGTH ALUMINUM-Bar Stock Components precision machined. Points of impact designed for extra strength.